THE WRITING BUDDHA - Opinions | Books | Movies: The Sire of Humellis by Aditya Prakash (Book Review- 3.5*/5) !!! 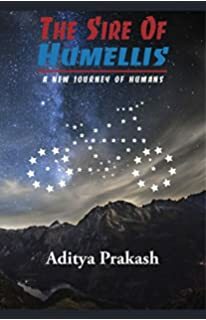 The Sire of Humellis by Aditya Prakash (Book Review- 3.5*/5) !!! This book shall always remain imbibed in my memory as it's the first book I read after getting my first job. Haha! There was always a question if I'll ever be able to read novels and review them after becoming a professional engineer and I am proud to claim that I read a book in my first weekend itself. :-) "The Sire of Humellis" is a 219-pages novel based in fantasy world. The writer, Aditya Prakash, have written this book with enough conviction which can be seen in its every word. But I am surprised by his choice of publisher as I have never heard about Champanzi Publication and their distribution network. Anyways, the book's tag line is "Belief Courage Passion" which is the baseline on which author have scribbled the whole story. Aditya Prakash's imagination skill is marvelous and it can be clearly seen in the second half of the book. He assures that he takes you on an adventure where you feel you are a protagonist and understand the hurdles that he has to cross to get past the line of survival. His narration is also easily interpretative because of which you grasp the story immediately without getting stuck in difficult names of people and locations that are mentioned in the book. The only issue is author's hold over the English language. There are many silly grammatical mistakes which can annoy a reader. A person trying to learn English might go on a wrong path by referring the sentences the author have formed in the book. Also, I wished his description to be little better in some parts where we really want to know how that fantasy world actually looked like. Considering debut, this last point can be avoided. The first half of the book is what makes me rate this book above average because it's written very crisply. Every emotion and imagination of the protagonist that the writer wants to convey can be easily understood and that makes the foundation of this very strong. The best part of the book is every description about the struggle of the protagonist in the cave. Just for that part, I will ask everyone to give this book a try. Even when it continued for quite a long time, I didn't get bored of it even once. Coming to the drawbacks, I didn't want the 2nd part to be a fight among aliens. I wanted it to be little more spiritual and personal. Though it had own dilemmas of the protagonist but it became more Hollywood-ish. Rest, I have spoken about the author's limitation on the language. The climax is nicely ended. I would give this book 3.5 stars out of 5. And I am expecting some great work from the author next time he comes up with a book. Why are we trapped in so many IDENTIFICATIONS? Is Raksha Bandhan all about only our families?